Hi, my name is Jonathon Cygnaeus, and I am from Stockholm, Sweden. 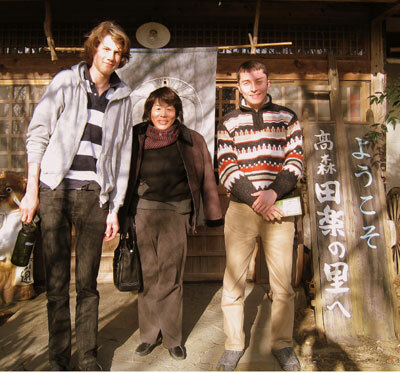 As a participant in the World Campus — Japan program, we stay in many host families. I had a great opportunity to live with the head of the Local Organizing Committee in Kumamoto city, Mrs. Maeda, along with Jamshid Ganiev from Tashkent, Uzbekistan. I had a great time from the moment I entered the house until I left. We had great discussions about several subjects, including life in Japan to bigger questions in society. They also taught me some simple Japanese. I really enjoyed staying with the family because of their immense generosity and kindness. One special highlight of my time staying with the Maeda family was visiting Mount Aso, the biggest active volcano in the country and one of the largest in the world. It was one of the most impressive sites I have seen. It is host families like the Maeda family with their huge generosity to open their home to a total stranger that really makes World Campus — Japan program such a great experience. Thank you to all the host families we have had on the road for opening your homes to us and for including us in your daily life, really making us feel like part of your family. We will treasure the memories made with you for years to come. Thank you Jonathan for your nice desribsion of Maeda san’s care & love. Additionally I want to say that: without having helpfull Maeda san, probably I would never fill myself, like I’m at home. And her willingness to learn about Uzbek culture and traditions, were amazing, so I’m really impressed with her interest. Also, Maeda san shows us the best example of building a super support team from university students. And now, I can call Kumamoto city support team as a best one.